This is the place to turn on your creativity! The arts and crafts program at Deer Crossing is designed to teach children creativity and basic skills in arts and crafts. We do not sell or use craft kits. 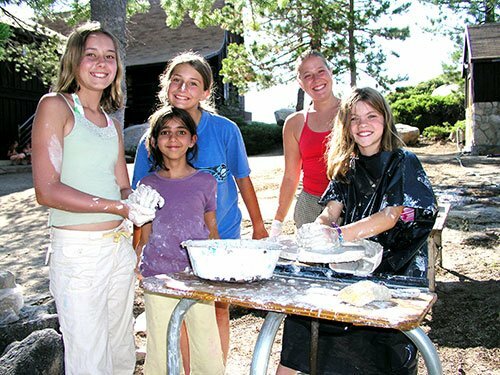 Instead, campers enjoy classes in drawing, watercolor, tie-dying, painting, sketching, cartooning, clay, pottery wheel, mask-making, book-making, beading, weaving, friendship bracelets, kites, knitting, sewing, making hacky-sacks, fly tying, leather work, dream-catchers, mobiles, art from natural materials, jewelry-making, rubber stamps, and paper-making, and more.